The Authority - CT Authors & Publishers Assoc. The Authority is the voice of the Connecticut Authors and Publishers Association, a group of about 150 authors who share information about writing and the world of publishing and marketing books and work to support one another by helping new writers to succeed and established writers to find new marketing avenues. Now you noticed that I didn’t say, “Every author needs a blog.” I have learned that a book blog is a specific form of marketing. In my case, I have five books on five different dog breeds. That means that I now have five different blogs; one for each title. I learned that having a blog for my business was not enough. Google spiders, the programs that search everything that is posted on the internet and decides where to put it on those lists you see when you type in a topic have a specific way of judging where your blog will go. The most noted of these is that your topic must appear as the first word in your title, in the first sentence of your first paragraph and in the first sentence of your last paragraph. You must also have tags that send the spider to any topic related to your book. To give you an example, my newest book is called The Crafty Newfoundland Knits. It is a knitting book written for people who love Newfoundland dogs. Believe me that is what is called a micro-market. So, for me to come to the attention of these specific people, I set up a blog for this book titled Newfoundlands – Crafty Dogs Knit. The URL is http://newfoundlandscraftydogsknit.wordpress.com. This means that my topic is not only in the title on the page but in the actual URL. This makes it easy to remember. Use your book title or the topic and your title if the topic isn’t the first word. I decided to use the Wordpress free blog system to set up these blogs. Since I had five books and therefore five blogs; and since much of what I would be saying in one would be repeated in the others, this system worked well. The reason for this is once you go to your dashboard (the area where you type and put in pictures) of one blog, you have access to all. Now if you want to do a fancy blog, Wordpress does have features that can be added for a monthly fee, but I find that their free package had everything I needed to create the look I wanted. I first clicked on “design” and chose a backdrop. The one I chose was pretty and had a lovely scene of cliffs and the ocean. However, my book is about knitting and Newfoundland dogs. So while still in “design”, I clicked on “custom image header.” I checked to see the size of the picture in their design. I went into my files and chose a picture that I had from the book and cropped it to be that size and saved it under a new name. Then I went to “browse” on the dashboard and found the correct file, clicked on upload which allowed me to substitute my photo for the one they supplied. Now the website is truly about my book and the topic is obvious. The next thing I did was go to “Write” and clicked tags. This is where I put all the words that I thought that people would type if they were looking for my topic. Finally, I wrote the opening page of the blog which will be where I do my posts and I uploaded a copy of the cover to that page. I decided that I would use the “About” page to tell about the book and the series. But I wanted more. I wanted a static page that would show people some of the inside of the book. I went to “Write”, clicked “page” and labeled it “Inside the book.” Here I uploaded photos and the table of contents as well as the cover again and some photos. I place links on each page go to my shopping cart to buy the book. I might have linked to my Amazon page for the book, but I make a larger profit when they buy from me direct so I chose to do that. Once everything was done, I checked it over and then clicked publish. Much to my delight, by that evening when I typed “knitting, dogs” into Google, my page came up on the first page of the list. Now to keep it active, I need to post often and hopefully get people to respond and link to it. But the hard part was done, for that book. All I had to do was repeat the above four more times for four more books. It is work, but it is also a direct link to sales and this is what the publishing business is all about. Try it. 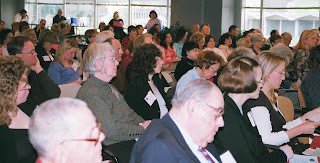 Again this year the Connecticut Authors and Publishers Association welcomes writers , and those interested in all aspects of the book world to its professional development program, CAPA-U, which celebrates its fifth year. This year for the first time, all participants who have written books are offered an opportunity to market them in the CAPA-U Bookstore. This gives attendees a chance to show everyone their talent. Another major addition to the program is the chance for beginning writers to meet with top notch editors and learn how to get their books ready to be published. This guidance is invaluable. The keynote speaker, celebrated author Wally Lamb, entertains and inspires. His award winning books I Know This Much Is True and She’s Come Undone have been NY Times Best Book of the Year choice and Oprah Book Club selections. An outstanding team of agents , marketers and editors are on hand to help guide both novice and experienced writers through the intricate maze of the publishing world. These one-on-one sessions are supplemented with professional development workshops covering every topic of interest to writers inclu ding: fiction, non-fiction, memoir, the op-ed page, sports writing, writing book proposals, working with an agent, publishing, self-publishing, creating a buzz on Amazon, marketing, and even a panel that combines the agent, the writer and the publisher to answer the participants questions on how to travel the road to becoming a published author. 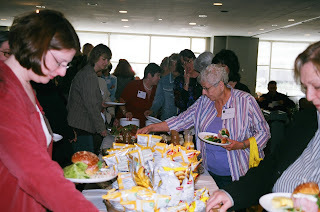 With a delicious breakfast and lunch provided by the chefs at the Hartford Steam Boiler Conference Center and the chance to explore the Bookstore to find new authors to read and new books by favorite authors, it makes the day one that is not to be missed. Peggy Gaffney, who will be giving a workshop at CAPA-U on self-publishing in May, gave us a preview in her talk to CAPA members at the February meeting. She published her first book in 2005 but the seeds of her efforts were sown throughout her life. 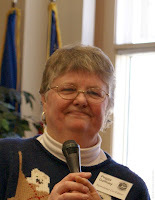 She has enjoyed a career of teaching and hobbies like knitting and raising Samoyed dogs. A few years before retiring Peggy decided to start a business which would serve as a source of future income. She began knitting sweaters which portrayed the Samoyed dogs she loved. When she presented her samples at popular dog shows, she was pleased to accept many orders for sweaters depicting breeds of all types. Peggy’s knitting business began to soar. Peggy noticed that some of her customers were interested in purchasing patterns to knit these sweaters themselves. At first she resisted sharing her patterns with them and then a light went on in her head. Why not publish these patterns and offer them for sale to the general public. Peggy drew her own pictures from photos she had collected through the years. Each one of them offered a visual example of the personality of the breed. She then calculated how to set up a graph for each design. The charm of Peggy Gaffney’s story is that she could understand the world of dogs and how people within it relate to the love of their particular pet. 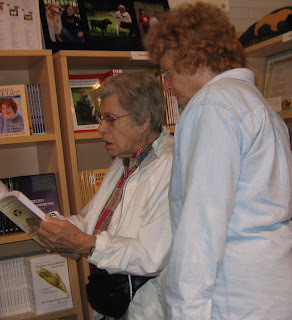 She enjoyed hearing anecdotes about them many of which she includes in her books. She told the CAPA audience one story of a the dog that at the last minute in her run around the agility course, momentarily ran off her path to a first place win to grab a bite of a sandwich from a bystander. She collects stories from her network of friends who showed dogs and include them in knitting books. The stories of the breed’s activities and the fact that her designs based on those activities of a single breed within each book makes them unique. Peggy has since written and published so far in this series a total of three books. The first deals with her own breed which she has bred a nd shown for 40 years, the Samoyed. The second deals with the Labrador Retriever and the third with the Golden Retriever. Peggy follows a similar construction when writing each book. A third of the book contains 25 basic knitting patterns for various projects. Another third deals with anecdotes about the particular breed, and the other third is made up of charts showing all of the dog’s activities converted to graphic patterns to be knit for that particular breed. Keeping this same basic theme for layout in every book saves time and effort. Peggy self-publishes all her books so that she can get the most profit from her efforts. ISBN numbers are gotten from a site for “Bowker.” Her photos are taken by herself or friends such as a field photographer who agreed to do the photos as illustrator for the retriever books in order to get illustrator credit for her portfolio and so that more people would see and appreciate her work. Peggy lays out her own manuscripts, covers, and converts them to pdf’s. She then gets in touch with her contact, Bobbi Rodriguez, at the book printer Fiddler Doubleday. Bobbi quotes a price and sets a printing schedule for the work and emails it back to P eggy for approval. Once Peggy gives her final approval, Fidlar Doubleday goes ahead and prints the book. Within eighteen days Peggy receives a shipment of books which she stores in her own home. Peggy does her own fulfillment. 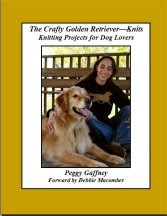 Peggy’s books can be purchased on Amazon or from her Kanine Knits website. Peggy has gotten her books on Amazon through the Amazon Advantage Program. She also had a distributor specializing in craft books that handles making her books available to knitti ng shops. Peggy networks on the computer through Yahoo. She has constructed a her own Kanine Knits website, a Kanine Knits Blog, a My Space Page as well as setting up a page on the new social networking site for knitters, Ravelry. If you Google Peggy Gaffney, you will appreciate some of the results of her efforts. Congratulations, Peggy! 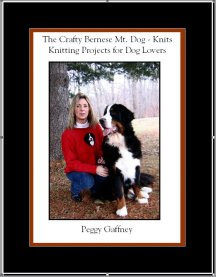 Peggy Gaffney is the author of the Crafty Dog Knits series: The Crafty Samoyed Knits, The Crafty Labrador Retriever Knits, The Crafty Golden Retriever Knits, and the soon to be published Crafty Bernese Mt. Dog Knits. She also will soon be bringing out a book on self-publishing and one on dog obedience and square dancing with dogs..
Carol Keeney is the author of "Brand New Teacher" a guide book for educators. I am officially a children’s book author. 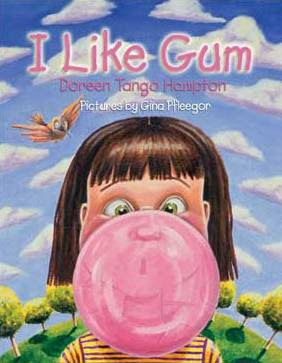 My children’s picture book titled I Like Gum was recently released by Shenanigan Books. 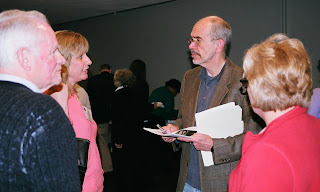 I have been asked to share my publishing experience with fellow CAPA members. I hope my story will provide some helpful insights. In September 2005, I had written a series of four children’s picture book manuscripts. I was an agent-less, first-time author with absolutely no knowledge of the publishing industry. What next? I went to my local library and asked for assistance. With the resourceful help of the Reference Librarian, I discovered an invaluable guide to the children’s publishing world titled The Children’s Writer’s & Illustrator’s Market. The book contained lists of children’s book publishers and agents. There is also information regarding the manuscript submission package. Not only did I learn exactly what I should include with my submission, I also discovered what not to include. To my relief, I learned publishers want text only manuscripts from authors who are not illustrators. It is the job of the publishing house to match the author’s text with an artist’s illustrations. If you decide to submit your friend’s illustrations with your manuscript, you run the risk of a visual rejection before your story gets reviewed. I heard the term “query” letter for the first time. I learned the significance of composing a strong query letter and the ramifications of writing a weak one. An interesting, well-written piece might pique an editor’s interest. A trite, boring letter will not produce an editor’s request for the manuscript. I reviewed each publisher’s manuscript submission policies and followed each set of guidelines to the letter. I did not want my masterpiece ending up in a recycling bin without ever having been read. Some publishers required only a query letter. Others wanted the entire manuscript. Some requested electronic submissions; while, others preferred a hard copy in the mail. The manuscript had to be ether single spaced or double spaced, depending on the guidelines. I created a database listing all the publishers to whom I had sent my manuscript (I didn’t want to send my story to the same house twice). Be diligent, but remain objective. Do not waste a publisher’s time or yours. Many publishers clearly state they will NOT accept unsolicited manuscripts. Some houses reject multiple submissions. They want exclusive submissions sent only to them. Others accept manuscripts during a stated timeframe. Still others have an open-ended submissions policy. Following all the guidelines is meaningless if your story does not match the publisher’s needs. Do not submit your manuscript if your story is exactly what the publisher is not looking for at the present time. Even more information regarding publishers, agents and manuscript submissions can be researched on the Internet. I googled “children’s book publishers,” “children’s literary agents” and “query letters.” The Internet became my most utilized resource. Be sure you are reviewing current websites. I discovered some websites had not been updated in years. An out-of-date website is of no benefit. Spread the word. Talk about your book to everyone. I began scouring local newspapers for book events. I attended author singings, readings and book fairs. I asked questions constantly and found authors graciously shared helpful information. Check out publishing house catalogs to learn what individual publishers are producing at the present time. Visit bookstores to see what books are “hot.” I sat in the Barnes & Noble in Canton one afternoon and just watched the reactions of children. They are my audience, so I listen and learn from them. Join organizations. I heard about the Society of Children’s Book Writers and Illustrators (SCBWI) and immediately signed up. The newsletter provides a wealth of knowledge. There are two SCBWI conventions each year that offer workshops, guest lecturers and manuscript critiquing. There is a Southern New England chapter that offers regional events. Enter writing contests. Not only is the exposure beneficial, the financial rewards are a nice addition. The Internet lists numerous writing contests. Scholastic and Women’s Day Magazine jointly sponsor an annual writing contest specifically for children’s book manuscripts. The Tassy Walden Awards: New Voices in Children’s Literature sponsored by The Shoreline Arts Alliance is a competition open to writers and illustrators in the state of CT. Despite all of the resources outlined above, getting a children’s book published is not for the faint of heart. It will take every ounce of tenacity, persistence and perseverance you can muster. From September 2005 until August 2006, I worked tirelessly to find a publisher and/or an agent. My manuscript was rejected by 82 publishers and 64 agents. Instead of feeling discouraged, I decided to submit another story. After spending a weekend with my five-year old niece, I came up with the I Like Gum concept. I worked on the story for a weekend. I decided to submit my manuscript to the one publisher who had sent me the nicest and most constructive rejection letter. Five days later I received an email. Shenanigan Books wanted to publish I Like Gum. I signed the contract in September 2006. My book was released in September 2007. The entire process, from conception to publication, lasted one year. Currently, my publisher and I are working out the details of my second book. It has been an exhilarating, joyful and at times frustrating process. But, I am loving every mile of this ride. I hope you, too, get to savor your first publishing experience, with the anticipation of many more in the future. 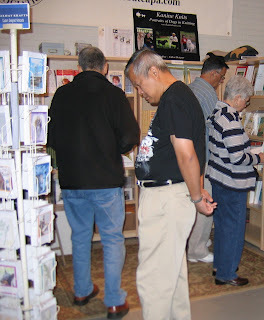 This was the first experience for CAPA member to market their books through a booth at the Big E and I thought I’d share my experience. On Tuesday I was scheduled for the afternoon-evening session and when Debbie Kilday and I arrived, the booth was busy so we explored before it was our time to take over. Once we got going, there was a flow of people interested in the books, CAPA and the whole concept of authorship. People were very friendly and they for the most part were looking for fiction (primarily mysteries), history, travel, and children’s picture books. 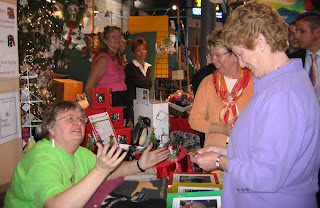 Though they were fascinated with my knitting books, they weren’t selling. The six hour session went relatively quickly because people stopped to talk and check out the books. Everyone who showed any interest was given a contact list with the names and books of the authors involved and their websites or email. The only real surprise for me is the people who when asked if they’d like to know more about the books, told me point blank that they didn’t read books or that they hated to read. This concept was new to me and I feel really sorry for them. Luckily there weren’t many of them. Driving home from the Big E at the end of the session was a challenge in that they are repaving I91 and what should have been a 50 minute trip became a 90 minute stop and go session. However, I was up again the next morning to do a double shift at the CAPA booth. I brought my knitting so I wouldn’t get bored, and shared the morning session with Elizabeth Faragher. Elizabeth was the “featured author” first and did a land office business with her beautifully illustrated children’s book “Off to the Fair.” It was the perfect sell for the day because people connected the fair experience. The crowds were constant and the booth was full of browsers all day. This was Connecticut Day and there were many people from the state walking through. The interest in CAPA was very high. It seams that everyone has a book inside him just waiting for someone to show him how to get it published. I chatted with people from my old home town and my present one. When it came my time to be “featured author” I was glad to sit down. I got out my knitting and my sweaters and books and began talking to everyone who stopped to look. There was a lot of interest in books coming in the future and the pattern they could order off the website. I even had a bunch of people interested in ordering custom knit sweaters. However, I discovered as the day progressed, that though there was a lot of interest in the topic of my books, there were very few knitters visiting the Big E that day. However, as the day continued, my pitch changed to having them pass on my card to friends and relatives who were much more my target market. I gave out well over a hundred cards that day. The high points of the day came later. Elizabeth had finished her shift a nd Jan Mann had taken over. Miss Connecticut came through with her publicist and explored the booth checking out the children’s books. Then about four o’clock, Governor Rell and her group came through. She loved the booth and my books. One of her aids took a few photos of me with the Governor and Jan got a chance to talk with her as well. Jan’s session as “featured author” ended the day and she sold a number of books to people interested in the concept of Cruising Connecticut with a Picnic Basket. I was able to get shots of people visiting the booth while I was shar ing more information about the group. At the end of the day I was left feeling that it had been worthwhile. As for the booth as a place to make money, I’d say it depends on the type of book you sell. General fiction, non-fiction and children’s books are the best sell for this crowd. The trip home took 2 hours and 10 minutes, so I hope if we do this next year, they won’t feel the need to repave in September. When I was in sixth grade, I wrote the following in a car contest: "If a strong and sturdy car is your delight, come to Shapiro's and be treated right." I won! I must have had ideas about promoting at that young age. I have had many ideas on promoting and marketing my books. They may not be the traditonal ways but they have proven successful. My biggest promotion is a book party at my home. I usually have 75 to 100 friends, town officials and anyone interested in attending a party. I have had an orchestra for the past two books. For my second book, "Unforgettable Recipes and Savvy Consumer Tips", I had local cooks bring samples of their recipes in the books to the book party. 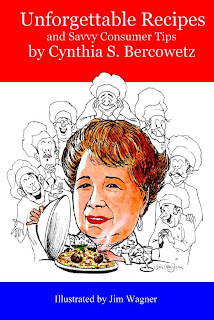 The introduction of the book is by a well-known chef and he attended too with his recipes that made a hit. 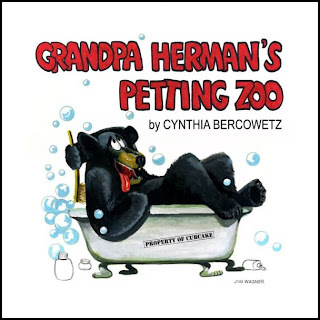 For my third book,"Grandpa Herman's Pettng Zoo", a true story about animals at a former petting zoo at COPACO in Bloomfield, I will have a local farm bring over some of the animals that were similar to the ones in the book. They will be outside on our lawn. I tuck a book at my dentist's office and other medical offices I visit. It pays off. P atients have called to purchase books. In Naples, Fl., I had a book party at the Elks Lodge. The chef at the Lodge has recipes in the book. It was most successful. I had a book signing at a book store in Naples that did not have a high attendance. I went across the way to a pizza place for lunch. Customers asked why I was dressed up and the others were very casual. I told them about the book signing and many in line wanted to buy my books. So, there I was book signing at the pizza place. I also like to help other authors to promote their books. I have a TV show on Channel Five and interview guests. For further information, contact me at consumreye@aol.com. Podcasts – Radio for the Internet? What is a podcast? Well they are in many ways similar to a radio program created by non-professionals to be shared with people of like interests. However, this isn’t Fibber McGee & Molly. These are usually talk broadcasts that could be interviews, discussions, lectures, readings or just someone chatting about something that interests him. So what value do they have to writers? How many of us can afford to take classes and continue our education on a daily basis? How many can afford the time to attend workshops to hear ideas in your field? If the answer is that you don’t have time or the money, the podcast might provide an answer. How do you get a podcast and what does it cost? There are many ways to receive podcasts and more growing every day with iPods, interactive cell phones and a fascinating collection of pricey gadgets. However, the cheapest and probably most practical way won’t cost a thing. On your computer you access the internet and go to the site for iTunes. You can follow the directions to download the iTunes program into your computer. Once this is done, you click on the iTunes Store and find the word podcasts and click on that. When it shows you some of the thousands of podcasts on every subject, go to the upper right hand corner and you’ll find a search section. If you type in “writers, writing” up will come a long list of shows on these topics. Most of these are free and can be had by just clicking on the subscribe button and downloading them. Cost for most of them is nothing. 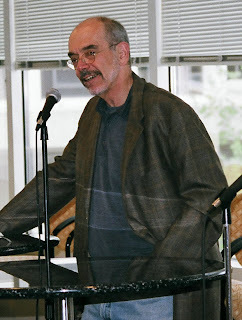 Mark Moxon - Travel Writer, Novel Writing with Brian Jepesen, Lit Law for Writers on the Go!, Femslash Writer’s Corner, The Kwantien Writers’ Guild and Writer’s Voice. Now these are only a sample of writing podcasts and each might have 20 to 50 episodes so the wealth of information is mind boggling. Also these are just ones on writing, there is also marketing, self publishing and speaking to say nothing of the podcasts on your specific genre. For example, I have been listening to a number of podcasts and one appealed to me to the point of my sending the moderator copies of my books along with the online information to point her to my website and a nice note about how much I enjoyed her weekly broadcasts. The next thing I know, she is reviewing (very favorably) my books on her show and telling everyone to go to her webpage where my contact information will be listed. She has a listening audience of a half-million. I was delighted. The best part of the podcast world for me is that these podcasts can play on my computer any time I want and they don’t interfere with other programs. So as I work on sizing photos for my next book, I can at the same time listing to a half hour discussion of yarn and knitting or writing mysteries or marketing self published books. So give podcasts a try. Listen and learn. Maybe some day you’ll want to do your own. If you think you might, there are even podcasts telling you how to do that as well. It may not be Fibber McGee but its “radio” for a new age and something we can all enjoy. 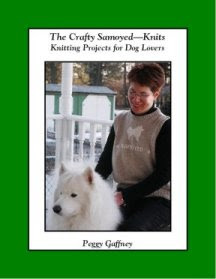 Peggy Gaffney is the author of the knitting book series The Crafty Dog Knits whose books cover the dog breeds Samoyed, Labrador Retriever & Golden Retriever. Shes is also the designer of a large collection of knitting patterns issued under the label Kanine Knits. Visit http://www.kanineknits.com. "The Authority" CT Authors & Publishers Assoc. Mar. 15 - Barry Karrigon, "Cover Design"
Feb. 16 - Peggy Gaffney - Kanine Knits Pub. - "Self-publishing for the niche author"
Jan. 19 - Whitney Patsos, Connected Content - "How to do PR on a shoestring" * Meeting at Avon Middle School. 1) Your promotional dollars are more efficient because of less wasted circulation. You can be very specific in the people you contact and the benefits your present. 2) Your title may be the only one available in a place where there is no competition and no price comparison. You can offer your books for sale in car washes, doctors’ offices, banks, restaurants, ski lodges, movie theaters, appliance stores or coffee shops. 3) It may be easier to sell to niche markets than those in large corporations. Proprietors of small businesses look upon books favorably as a special service to their customers, a source of incremental revenue. 4) Most of these venues purchase directly from the publisher, so there may be no distribution discounts. 5) The individual orders will typically be smaller than those in the Commercial Sales segment, but you will find the buying period shorter, the process less formal and access to buyers through mass communications.